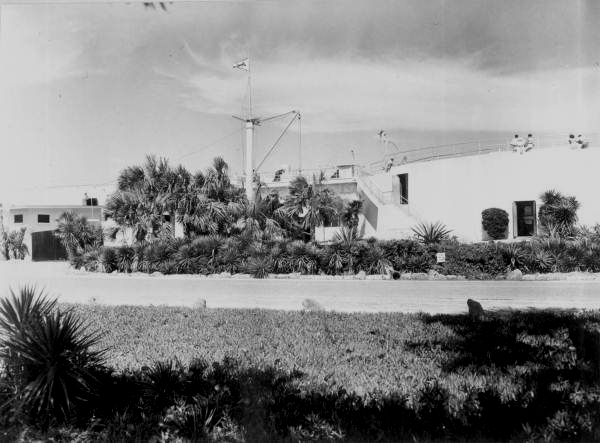 Marineland 1949 from the Florida Department of Commerce Collection at Florida Memory. The gift shop is shown on the right and the small building on the left was a snack bar. The large structure was the circular tank where the dolphins were kept and behind it was the rectangular tank that held most of the other sea life on display. Today, the circular and rectangular tanks are gone. This photo from the Florida Photographic Collection shows the dolphins in the circular tank being fed and is dated 1962. We spent a lot of time in that neighborhood in the early 1960s, but I don’t remember that pier in the background.